2. Wash and peel fruit. Cut peel in thin strips and place in a saucepan. 3. Add cold water and simmer, covered, until tender (about 30 minutes). 4. Drain. Remove seeds and membrane from peeled fruit. Cut fruit into small pieces. 5. Combine peel and fruit in saucepan, add boiling water and sugar. 6. Boil rapidly over high heat, stirring frequently, until the temperature measures 8°F above the boiling point of water (220°F at sea level), about 20 minutes. 7. Remove from heat; skim off any foam. 8. 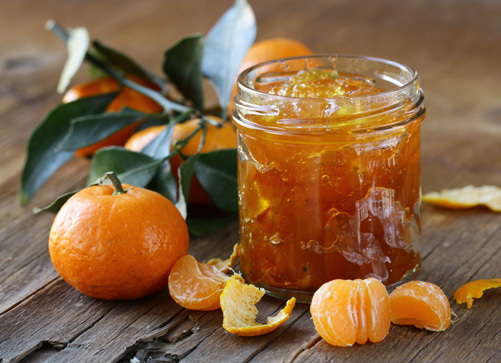 Pour hot marmalade into hot, sterile jars, leaving ¼ inch headspace. 9. Wipe rims of jars with a dampened clean paper towel; adjust two-piece metal canning lids.